Antonio Linares' defense was good, he told The Spartanburg Herald-Journal in 1989. It was at the plate where he needed to improve. "I handle the curve all right, but my main problem is with men on bases," Linares told The Herald-Journal. "I can't wait for the ball. I just swing at any pitch. I need to swing to just put the ball in play." Linares spoke to The Herald-Journal in his second professional season, just 19 years old. But he apparently never got to correct those problems or others. He ended up playing just one more professional season, never making it out of single-A. 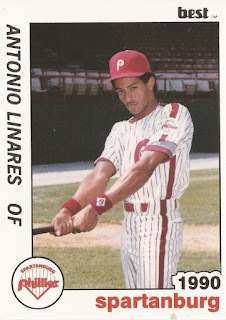 Linares' professional career began in 1987, signed by the Phillies as an undrafted free agent out of his native Dominican Republic. Linares didn't make it to the field, though, until 1988, playing at rookie Martinsville. At Martinsville as an 18-year-old, Linares got into 43 games, hitting .284. He also hit four home runs and knocked in 23. For 1989, Linares moved to single-A Spartanburg. In 101 games on the year, the outfielder hit .245, knocking in 27. Linares stayed at Spartanburg for 1990, getting into 72 games and hitting .268. In one April game, he doubled and scored. He then picked up two hits in another April game. But it was Linares' final professional season, his career ending at season's end, short of the majors.